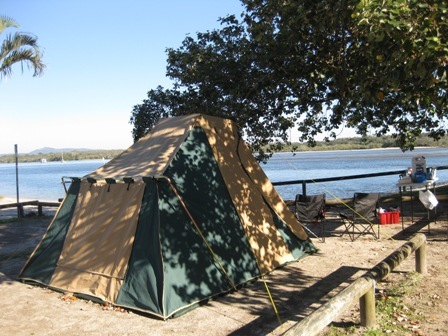 I have updated my camping gear checklist to reflect changes in my camping kit as a result of losing a lot of gear in the Queensland 2011 flood, but also changing my preference for gear based on our camping experience. The biggest changes are away from gas stoves/lanterns to Coleman dual fuel appliances, and away from a huge tarp that covers our tent, to a smaller tarp for eating under. parts/clean-up box — spare bits and pieces that I might need, torches, and clean-up gear such as the washing up basin, cleaning fluids, dustpan, etc. I also carry a very small tool bag. Once again, my gear is based around camping at unpowered sites in campgrounds. For some minimalist campers (such as hikers), this list is way too much. I am camping with young kids and my wife, so need to have a reasonable level of comfort. On the other hand, many people camp with a lot more than this and may consider my list to be just the basic essentials. For example, I know some people who have a microwave and air-conditioner in their pop-top camper – and they wonder why the trailer is so heavy! Of course, personal effects (such as clothes and towel) are in addition to the following list. You may now be thinking that you have to go out to your local camping store and spend a small fortune. My favourites are Down Under Camping and Great Escape Camping, as well as the chain stores BCF and Anaconda. However, it is possible to save lots of money by careful purchasing at supermarkets (eg. Coles, Woolworths), department stores (eg. Big W, Kmart and Target) and even discount stores (eg. Crazy Clark’s and Dollar and Sense). Items such as picnic plates, cutlery sets, plastic cups, clean-up gear and so forth can easily serve duty camping. Just remember, make sure everything is unbreakable! This entry was posted in Gear and tagged Camping, How To, Swag, Tarp, Tent, Travel on 21 February 2012 by Rex. They are fun to participate in, but much of the content is very juvenile and amateurish and not what I would to find in a serious isabel marant dicker boot search.